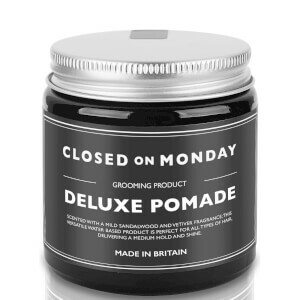 Rework your hairstyle with the Closed on Monday Deluxe Pomade, a water-based hair gel that provides all-day hold for short, fine hair without stickiness or stiffness. Delivering a medium hold and subtle matte shine, it doesn’t leave any greasy residue or build up, allowing you to mould and alter your look throughout the day. Scented with a subtle earthy aroma of Sandalwood and Vetiver, the versatile product has the look of a wax but the hold of a gel. This gel-wax type pomade works extremely well on dry or slightly damp hair. Once your hair is dried to the desired effect, scoop a finger of Deluxe Pomade and work between the palms of your hands; coating both hands and fingers. Run through your hair allowing the hair to pull the pomade from your hands. Distribute evenly through roots to tips. Finally, if required, combing from root to tip will leave you with a sharp finish. Aqua, Ceteareth 20, DiPropylene Glycol, Capric/capryllic, Triglyceride, Beewax, Polysorbate 20, Castor oil POE 40, Phenoxyethanol, Sodium, Hydroxymethyl glycinate, Parfum, Limonene, Linalool. Slightly thicker than I was expecting. The consistency is a little greasy when in your hands, but it washes very easily. In your hair there is no greasiness and the hold is good. I apply and brush each morning and it keeps a nice quiff all day.